The culinary traditions of the Middle East have always been enriched by the incredibly diverse and often turbulent passages of this region’s history. In a unique melting pot of Persian, Islamic and Ottoman influences, with a sprinkling of the Byzantine and Roman legacies also thrown in, The Middle Eastern Kitchen represents cooking and hospitality raised to the level of a fine art and pleasure and invites you to wholeheartedly join in. Whether delicate and spicy, aromatic and fragrant or scented and syrupy, Ghillie Basan’s dishes celebrate the Middle East as the world’s famous trading mecca – where Africa, Asia and Europe always met, traded and fused with unparalleled cultural diversity. 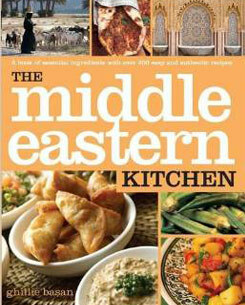 From Turkey to the Yemen, and Egypt to Iran, The Middle Eastern Kitchen contains over 150 authentic recipes and gives real insight into the customs and cultures of the Middle East. Each ingredient has its own section, from chickpeas and pomegranates to lesser-known orchid roots and melokhias, with information on its appearance and taste, how it grows or is manufactured and its culinary and medicinal uses, together with two or three specialty recipes. Jonathan Basan’s photographs are a feast for the eyes as well as the stomach and the mouthwatering Palestinian Bread with Chicken and Sumac or the Hot Chickpea Puree will have you reaching for the pots and pans.